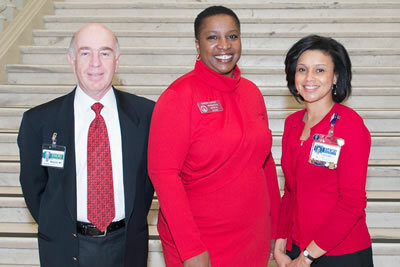 Emory Saint Joseph’s Hospital cardiac rehabilitation program participated in a “Wear Red” rally for women at the Georgia state capitol. Dr. Basil Margolis, medical director of cardiac rehab, along with unit director Jocelyn Disher, spoke to legislators and constituents about women and heart disease. 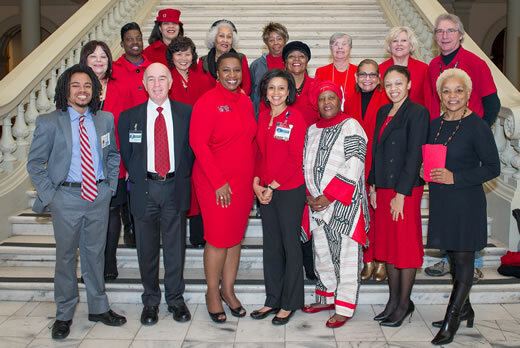 Georgia state representative Doreen Carter, from House District 92, hosted the rally in the south wing of the Capitol to bring awareness to heart disease among women, because of her personal history. A recent patient of Emory Saint Joseph’s cardiac rehab program after suffering a heart attack, Carter has a family history of heart disease. “My mother and grandmother died from heart disease, and it is the number one killer of women. The cardiac rehab program at Emory Saint Joseph’s really made a difference in regaining my strength. The purpose of this rally was to educate others about the benefits of the program, as well as exercising and changing their habits,” she says. along with unit director Jocelyn Disher (r) are pictured with Rep. Doreen Carter (center). Emory Saint Joseph’s cardiac rehab program is open to patients who have experienced a heart attack, percutaneous intervention, heart valve repair or replacement, coronary artery bypass graft surgery, heart failure or heart transplant surgery as well as those with chronic stable angina. The program also includes education classes on heart healthy living and risk factor modification as well as a supervised cardiac fitness program and the opportunity to meet with a registered dietician. For more information about Emory Saint Joseph’s cardiac rehab program, call 404-843-7663.